LAS VEGAS (AP) — Federal officials have designated portions of 11 western and central states as primary natural disaster areas because of a drought. The U.S. Drought Monitor, a federal website that tracks drought, reports that while storms have dumped rain and snow in the East, droughts are persisting or intensifying in the West. 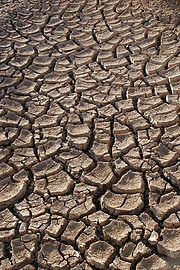 The worst states for drought are California, Oregon and Nevada, the monitor reported. More than 62% of the state of California is now in “extreme” drought, the state’s highest percentage since the Drought Monitor began in Jan. 2000. Extreme drought is the second-worst category of drought. Last summer, a massive heat wave hit the USA shortly after the US Supreme Court overturned the Defense of Marriage Act (DOMA) to support the homosexual agenda (see Russia calls Obama President of Sodom and Gomorrah and the US Supreme Court ruling on homosexuality today confirms it). SYDNEY — Heat waves in Australia are becoming more common and severe, according to a report released on Thursday by the nation’s Climate Council. The independent non-profit organization insists that extreme weather patterns can be attributed to climate change. The report comes as southern Australia braces for more punishing heat and emergency crews battle dozens of bushfires. Might there be a correlation between the current drought and trend for legal acceptance of the homosexual agenda in the USA and other Anglo-Saxon lands? The Bible teaches that God uses weather problems to warn people to repent? Those who think that the USA and the other Anglo-descended lands will always have plenty of affordable food and will always continue will be shocked when further destruction comes. Droughts, floods, weather issues, pestilences, and a reliance on more and more engineered and hybridized foods are putting the USA, as well as its other Anglo-descended allies, at severe risk. Destruction is coming, unless there is national repentance soon. This entry was posted on Thursday, January 16th, 2014 at 2:25 pm	and is filed under Prophecy.